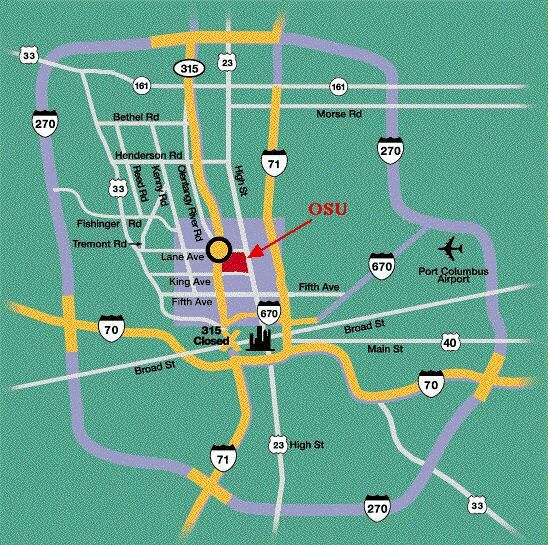 You can park in the OSU stadium lot (at Cannon Dr. and Woody Hayes Dr.) for free during the weekend . Parking closer may result in a ticket. OSU Cross Country Inn South, 614-766-0037, 1445 Olentangy River Road (At King Ave.). Or take I-71 to the Fifth Ave. exit and go west about 2 miles to Olentangy River Road. Turn right on Olentangy, the C.C.I. is at the intersection of Olentangy and King Avenue. The motel is about 1.5 miles southwest of the Mathematics Tower (MW). If you prefer, you can arrange for accomodations at Holiday Inn, 328 W Lane Av (Lane exit East off of SR315), 614-294-4848, close walking distance to the Math. Tower (but more expensive).